Capes and Cowls is a series of stories in the vein of Marvel or DC comics. Each series is self contained, but all take place in the same universe. Characters, locations, and events in the various series overlap. So far, there are four different stories updating on a monthly basis: Winston Luxard, Damocles, Johnny Quantum, and Dental Repair. 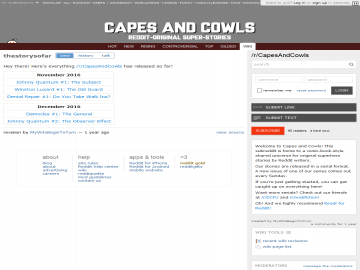 Capes and Cowls, a new shared-universe serial written by four redditors, offers not just one but four fresh takes on the superhero genre. The only reason I didn't rate it even higher is that it's only just started; if it continues to be this impressive, it could easily make 10 in my mind. Capes and Cowls has not been recommended yet.